As a forklift operator, you may be tasked with handling hazardous loads. It’s important that you handle the load with the utmost care, according to OSHA’s guidelines. But before you can safely handle the hazardous load, you need to know hazardous load signs to avoid a potentially dangerous situation. 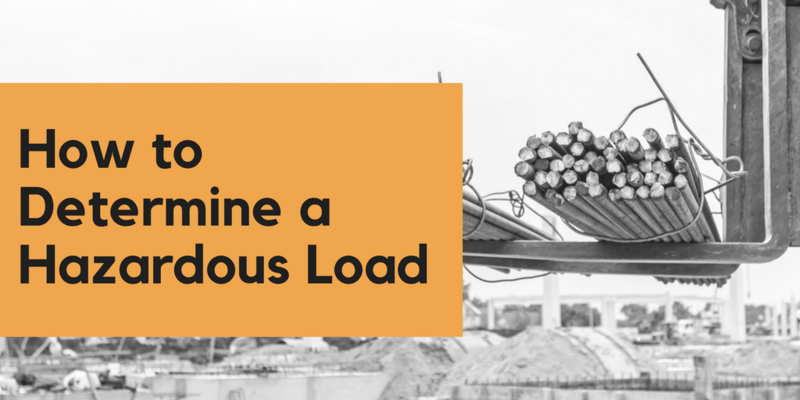 Here’s how you can determine if a load is hazardous, and how to react. A load can be hazardous without containing any dangerous materials. The danger comes when the load itself is packaged and shaped in a way that can cause instability with the forklift. When a load shows physical hazardous load signs, a forklift operator has to be careful when lifting the load. If an unstable load is attempted, it could fall off the forklift and hurt the operator or other workers. If it were to be stacked on a warehouse rack, it could fall and injure or kill workers on foot. If a load is physically hazardous and meets any of the traits listed above, operators must determine whether it is safe to maneuver or not. If it meets protocol but is uneven or has loose parts, operators must assess the safest way to accommodate the load. Proper training can aid in this. In the situation where you are handling a load containing hazardous materials, extra precaution is necessary to avoid accidents. For a complete list of all types of hazardous materials, read the Hazardous Materials Regulations guide created by the U.S. Department of Transportation. Hazardous materials require extra care when handling. Forklift operators must know the proper precautions for handling, lifting, and stacking loads that contain hazardous materials to avoid serious accidents like burns, intoxication, suffocation, and inhaling cancer-causing compounds. Forklift safety training can not only help you to identify hazardous load signs but also how to properly and safely handle them without risking your health. Once you’ve carefully assessed the load and have identified any and all hazardous load signs, you need to know the steps for approaching and handling the load safely. When handling a physically hazardous load, start by securing the load so that it is stable on the forklift. Operators should not carry damaged loads unless they are secured by wrapping or banding. All loads should be centered as much as possible to create stability. When handling off-center loads that cannot be centered, use caution. Attempt to distribute the heaviest part of the load as close to the front wheels as possible. Operators must also always approach loads slowly and carefully. Never overload a forklift. Overloading can cause the forklift to tip-over and lead to serious injuries or fatalities. If a load is off-center, distributed incorrectly, or is oversized for the forklift, it has the potential to exceed the capacity of the forklift and cause an unstable load. Operators need to follow these rules for both normal loads and hazardous load signs. It’s always a good idea to ensure the load is tilted back with the forks positioned low during transportation to prevent the load from falling off the front or side of the forks. When handling a load containing hazardous materials, use the correct type of forklift for that use. Forklifts designated as DY (diesel powered trucks that have safeguards without any electrical equipment, and with added temperature limitation features), EE (electrically powered trucks that have electric motors and all other electrical equipment enclosed), and EX trucks (electrically powered trucks that have electrical fittings and equipment that can be used in certain atmospheres containing flammable vapors). When handling loads containing hazardous materials using a diesel powered forklift, workers need to be careful when refueling. A forklift must be refueled at specially designated locations, with the power switch off. Internal combustion engine forklifts cannot have any open flames or sparks. This could be dangerous while refueling and when handling the load depending on the type of hazardous material it contains. Review the OSHA standard for Powered Industrial Trucks to learn all safety practices for operating forklifts and handling loads safely. Identifying hazardous load signs is just one part of the equation when operating a forklift. You also need to safely approach, travel with, stack, and unstack loads without risking the safety of you or other workers. Forklift training is the best, most effective ways for workers to learn how to determine a hazardous load and handle it properly. When you complete forklift training with CeritfyMe.net, you will be OSHA-compliant and equipped with the knowledge you need to operate all the main types of forklifts safely. And the best part is, our training is all online in a convenient, easy-to-use format that can be accessed from any device with an internet connection and completed in only about one hour! Check out the forklift classes today!